This past Wednesday, my oldest son turned thirteen. I can hardly believe that we have a teenager in the house… It seems like, in the blink of an eye, he’s gone from my adorable, sweet, chubby baby boy to a handsome and mature young man. Even though I was almost positive I knew how he’d answer, I sent him a text while he was at school asking what kind of cake he wanted me to bake for him. Just as I figured, he wanted me to make my famous carrot cake — which I just realized I’ve never shared on here. I need to fix that ASAP! Anyhow, I ran to Walmart to pick up a few ingredients I was missing, and I was greeted at the door by the sweet aroma of fresh strawberries. Remembering an image I’d seen of some simple orange candy melt-dipped strawberries turned “carrots”, I added a container to my cart, along with a package of Wilton Orange Candy Melts to make some carrot cake toppers. Adorable… am I right?!? But it only took a small handful to decorate my son’s cake, so I was left wondering what to do with all of the leftovers? Well, other than just eat them as is — which certainly would not be a bad thing since they were totally yummy, too! It was actually my youngest daughter Addie’s idea to make some little Oreo dirt cups to turn our leftovers into carrot patches, and I couldn’t be happier with how they turned out. Addie agreed to help me with a short video to show you just how simple and easy it is to make these carrot patch Oreo dirt cups! You might recall how my kids have been complaining that we haven’t done many fun holiday-inspired crafts/projects lately… Addie said these treats would be perfect for Easter! Starting with Snack Pack Pudding Cups means that the Oreo dirt cups come together in a flash. All you need are the Snack Pack pudding cups and a package of Oreo cookies. The “carrots” require only fresh strawberries (look for containers with lots of leafy green tops) and a package of orange Wilton Candy Melts. That makes just four ingredients all together for this sweet little Easter project! Melt the Wilton Candy Melts in a double boiler (or use this DIY double boiler method). Holding a strawberry by the leafy green part, dip it in the melted candy and twirl it so it’s completely covered. Set on a parchment-lined baking sheet to cool. After all of the strawberries have been dipped, pour the remaining candy melts into a ziploc bag and snip off just the end of one corner. Drizzle more candy melt lines over the coated strawberries to give them a carrot-like appearance. Remove the cream center from about 12 Oreo cookies. Place the chocolate cookies in a Ziploc bag and crush them completely with a rolling pin. Open the Snack Pack Chocolate Pudding cups (now with new EZ open lid!). Spoon a thin layer of the Oreo “dirt” into each pudding cup. Place one of the strawberry “carrots” in the cup, and finish by spooning additional Oreo dirt around the carrot to make it appear as though it’s planted in the dirt. Here’s another Easter treat that my kids went crazy over a few years ago. 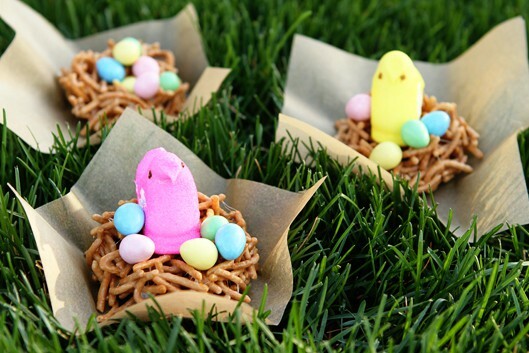 These edible bird nests are super simple to make, and they can be decorated with Peeps chicks, jellybeans, and more!